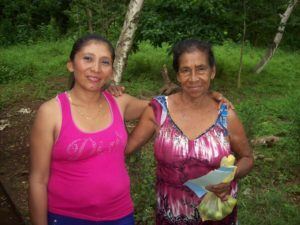 Mariana Amescua, a Mary’s Pence board member accompanied Gilda Larios, ESPERA Team Lead on her recent visit with ESPERA women in El Salvador. Mariana wrote the following reflection upon her time with these special women. The people in El Salvador certainly captivate your heart right away. And one of the reasons for this is that they never give up, ever. For our first visit, we started our day late for any Salvadorian, 6.30am. We traveled for three hours to get to San Vicente state, almost at the border with Honduras. You can cross El Salvador from one end to the other in six hours. We visited four women with ESPERA. People in El Salvador don´t really open up immediately to strangers. Too many foreign organizations have entered El Salvador claiming to help with war, gang violence, poverty, and women’s empowerment, yet have only caused further damage due to lack of understanding. However, Gilda Larios, ESPERA Team Lead, knows what to ask, and how to listen to truly understand. She has been there for 10 years, listening to women, walking with them on their different paths in search for a better life. I was honored to listen to them during this visit too. It was by listening to them that I came to understand how access to these community lending pools allows women to more fully participate, make decisions, overcome adversities and start imagining and working for a new life for themselves and their loved ones. One woman, Yana shared about the profitable chicken business she and her late husband had together, and how devastated she felt when he passed away. Together, they had had 3,000 chickens. Since then she has only been able to manage 300. Now, she would like to use her ESPERA loan to build a henhouse. 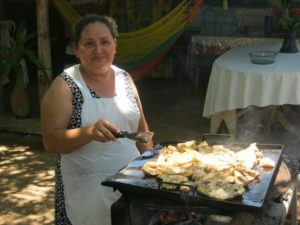 The leaders from Asociación de Mujeres Rurales –ESPERA´s partner organization in San Vicente – are supporting her, encouraging her to practice the business skills she’s learned so that she can be successful not only in her henhouse and this entrepreneurship, but to feel she´s capable to someday again have 3,000 chickens. 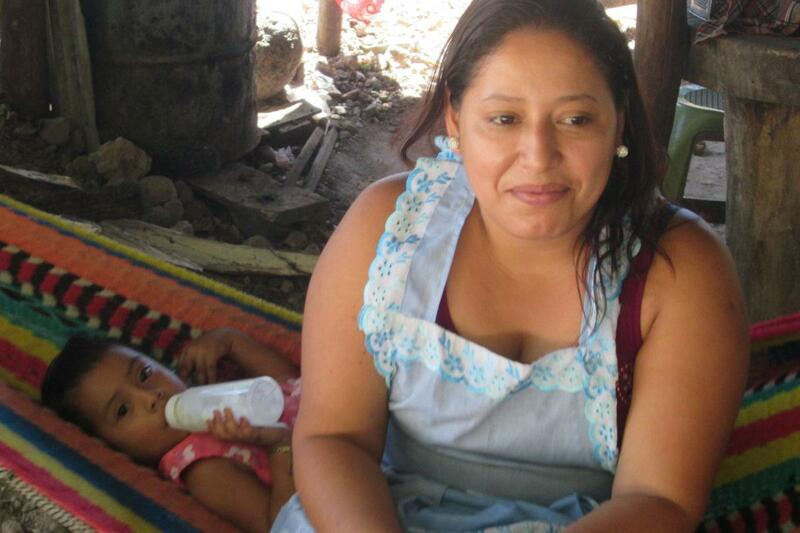 Yana’s husband might be gone, but now through the ESPERA program, she has a support network and the funds to carry on. 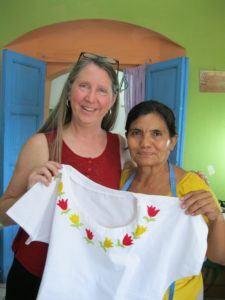 Gilda and the other ESPERA staff encourage Yana to continue working toward her vision. One of the staff will visit her again in a couple of weeks to talk to her, follow-up on her estimate to build the henhouse, see if she has found someone to build it, and generally be there for her. Just like Yana, many women have a deep, often generational knowledge of how to raise chickens or cattle, how to sew clothes, or how to create beautiful artistic pieces with what they have at hand, be it corn husks or indigo. Ambrosia is one of these women. She sold all her cattle so her son could have better opportunities in life. Her two daughters are still living with her and the three of them decided to use the ESPERA fund to buy two new calves and a cow. As in every business, sometimes things don´t turn out as expected: the first cow had a calf that died at birth. ESPERA funds are managed locally with rules that are defined by the community. Ambrosia and her daughters requested a year-long loan, expecting to start receiving money from their cow in a few months. Despite the setback, they are highly committed to paying back their loan and they have high hopes for the other two calves. They will carry on despite the circumstances. On the following day, I was present with the ESPERA staff at a strategic planning meeting for another one of our ESPERA partners in El Salvador. We were in Suchitoto, a beautiful little city an hour and a half away from San Salvador. This organization, Concertación de Mujeres, has around 200 members. In addition to the ESPERA lending pool, Concertación de Mujeres provides various forms of support ranging from assistance with women’s agricultural activities to support when they experience any type of sexual aggression, which is a major issue for many of the women. 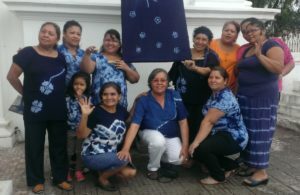 On that day, I could see how the women of Concertación were beginning to speak a new language to name aspects of the work they have done for years: now they are using terms such as strategies, goals, timelines, and deadlines. This common language opens up a world of new possibilities and collaborations for this rural organization. Mary´s Pence encouraged and financed this learning so they can have conversations with other global organizations. The ESPERA program is present, listens, asks questions and truly co-creates unique experiences and spaces that allow women to empower themselves, to make decisions they have never imagined before and to create a new life for themselves, step by step. As part of the Mary´s Pence community, I can only be thankful and proud to be part of such experiences.